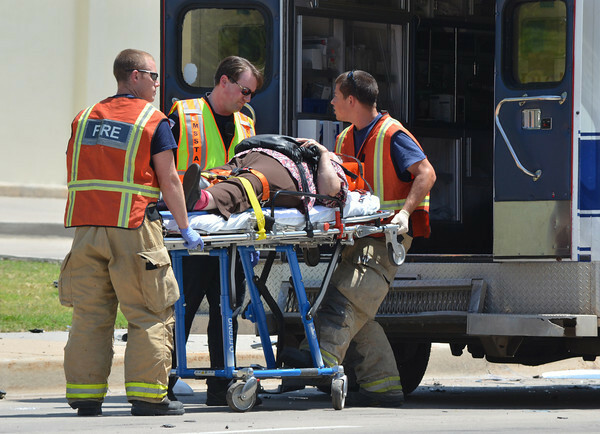 Norman paramedics load up an accident victim as they respond to a two-vehicle wreck on 36th Avenue NW just north of the Robinson Street intersection. According to Norman Police Capt. Tom Easley the preliminary investigation indicates the southbound vehicle, driven by a motorist with a learners permit, tried to make a left hand turn and in the process collided head-on with a vehicle travelling northbound on 36th Avenue NW. Two people were taken to the hospital with non-life thretening injuries. The driver of the southbound vehicke was cited for failure to yield while making a turn.